Garvic Ocelot, blue, mint body on card, still sealed. Sides of body show considerable warpage, and some light dents in blister bubble, but card still displays well. #41- 4/40x1/8 machine screws and nuts, approx. 6 of each. #42- 4/40x3/16 machine screws and nuts, approx. 6 of each. #43- 4/40x1/4 machine screws and nuts, approx. 6 of each. 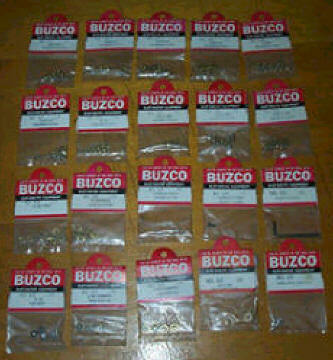 #44- 440x1/2 machine screws and nuts, approx. 6 of each. #45- 440 miniature nuts, approx. 12 in package. #47- 2/56x1/8 machine screws and nuts, approx. 6 of each. #49- 2/56 miniature nuts, approx. 12 in package. #50- 2x1/8 self-tapping screws, approx. 12 in package. #52- 4x1/8 self-tapping screws, approx. 12 in package. #53- 4x3/16 self-tapping screws, approx. 12 in package. #54- #4 washers, approx. 12 in package. #55- #4 internal lock washers, approx. 12 in package. #57- 4/40x1/8 allen socket screw, 2 in package. #58- 4/40x3/16 allen socket screw, 2 in package. #59- allen wrench, 2 in package. #60- 5/40 cap nuts, 4 in package, aluminum? #61- 4/40 combination nuts w/lock washers, 4 in package. #62- 5/40 combination nuts w/lock washers, 4 in package. #63- 1/8x1/4 oilite bearings, 2 in package. #64- three prong knock-offs, 2 in package, aluminum? Each package above is $3.00 per poly bagged package with Buzco header card. Any 4 packages for $10.00. Have multiples of some of above, so inquire if needed. 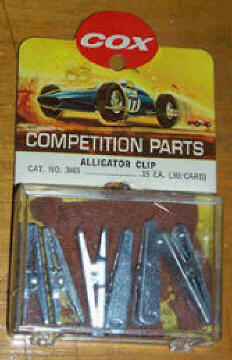 Cox Alligator Clips, box of 6 with original display card. Foam backing in box is deteriorating from age. 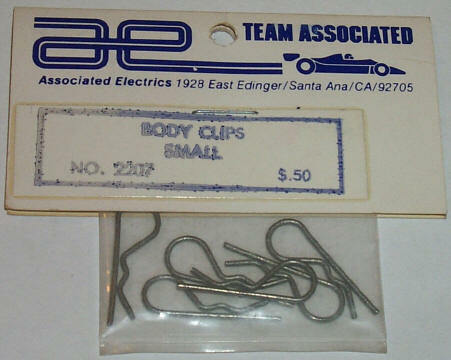 Team Associated small body clips for clear plastic body mounting, part #2207, pack of 6, mint on card.